MARTHA MOMENTS: Countdown to Christmas! 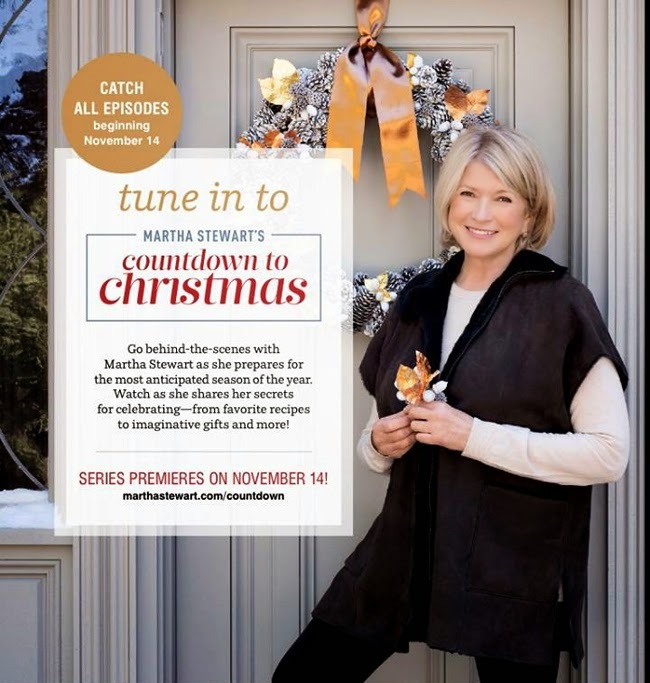 New episodes of ''Martha's Countdown to Christmas'' begin tomorrow! The popular web series is in its third season and is available to view only at marthastewart.com/countdown. In each segment, Martha reveals her favourite Christmas crafts, DIY decorating ideas and holiday recipes. I've always enjoyed this series and look forward to the next chapters. Click here to watch past episodes of the series, and new episodes beginning November 14th. PS Traveling Monday to London, I can't wait to see the Christmas decoration and spirit. Have all the episodes been posted? It seems like they're mostly the episodes from years past. Four videos have been posted so far. They are the ones in the top row: pumpkin brulee pie, brown-sugar cookies, scrapbooks with Darcy Miller and making a monogrammed tote bag.